Semi-elastic cotton tape, coated with an hypoallergenic pressure-sensitive adhesive. Features a thick cotton fabric with a yellow ocher center guide line for easy placement. Recommended for joint strapping. 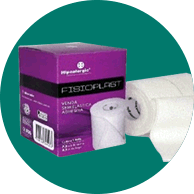 Indicated for bandages that require great adhesion, tension and mobility. Provides support for muscle and joint injuries such as sprains and strains. Ideal for sports activity and highly demanding training.